Spray 3 1/2- to 4-quart slow cooker with cooking spray. Add tomatoes and garbanzo beans to slow cooker. In 10-inch skillet, heat oil over medium heat. Add onions; cook until onions begin to soften. Add salt, jalapeño chile and gingerroot. Cook 1 minute. Stir in curry powder, paprika, garam masala and red pepper until fragrant and spices begin to brown. Add spice mixture to slow cooker. Add 3 tablespoons water to same skillet; beat with whisk to remove all spices and browned bits left in pan; add to slow cooker. Stir. Cover; cook on Low heat setting 4 to 6 hours or on High heat setting 2 to 3 hours. Serve with lime wedge and rice. Stir 3 cups baby spinach leaves into the Chana Masala after it is finished cooking. Cover; cook 10 minutes longer or until spinach is wilted. Basmati is the traditional rice served with Chana Masala; however, feel free to use your favorite rice. If you are in a time crunch, look for bags of frozen cooked rice in the frozen vegetable section of your grocery store. The spice level of this dish will depend on the size and spice level of your jalapeño chile. If you really like things spicy, increase ground red pepper to 1/2 teaspoon. Come home to dinner! 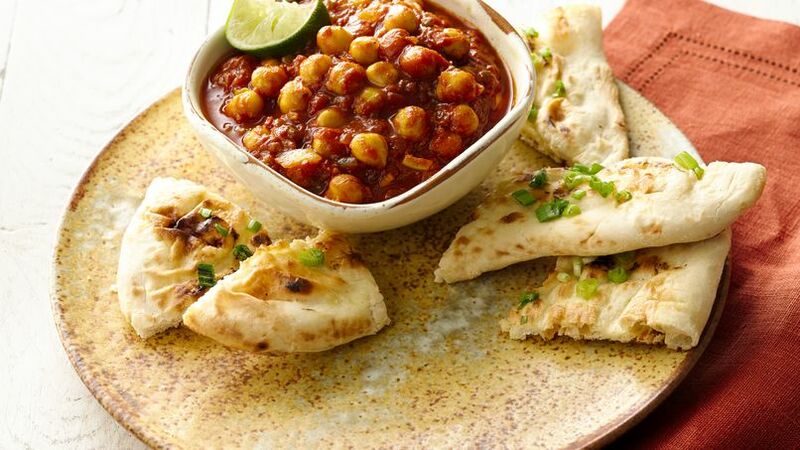 Have this easy twist on the traditional Indian dish, Chana Masala, waiting for you when you walk in the door.